Hi everybody. I've been using this forum as my guide into the world of cmos synths for a year now. And it's been awesome. I build some stuff, got a lot further then I expected with no training what so ever cause most questions I have you all already answered. But.. I ran into a problem with recording some of the sounds that I can't find an answer to because I don't know the question really.. other then, what is happening?! I made the kick drum from Hackadays Logic Noise series (sure everyone here knows it) it uses the 4069 chip. And I love it, played around with it, added some more voices and now want to record a drum track. On my headphones everything sounds perfect. But when I listen back to the recording there are these artifacts and I can't get rid of them. I tried adjusting the levels, tried running it directly into my four track (Korg D4) . Through a behringer mx400 or trough a tascam 424 and it is always there. Not sure how it is supposed to sound .. it seems to be too clicky at the start maybe? 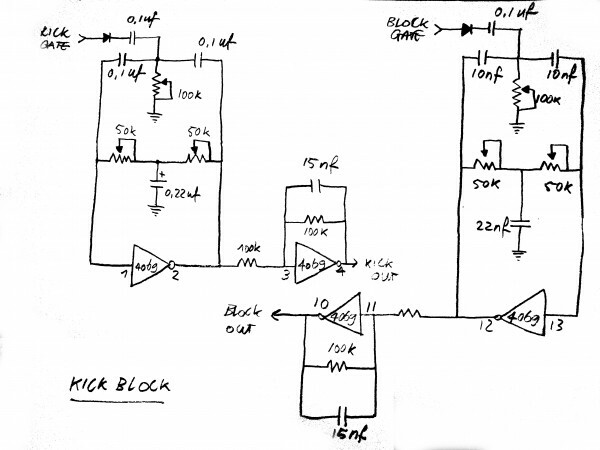 Anyway .. a schematic would be useful. I not hearing anything unusual from your track. It sounds like a logic noise "drum". Perhaps your headphones are altering the sound? The most likely thing is that they are acting as a low pass filter ... either they have a bass boost or the headphone coils are filtering high frequencies? 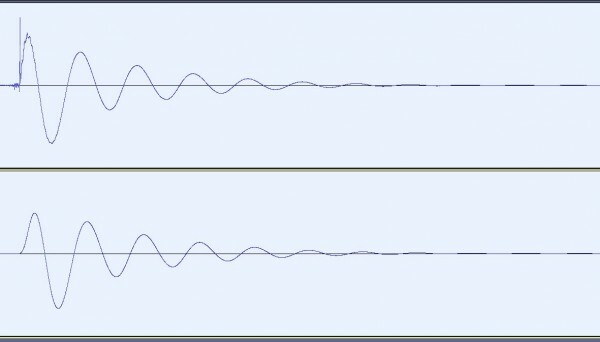 Try adding some simple low pass filtering to the output and see if that reproduces what you hear in your headphones. Hey, thanks for the replies guys! Exactly this is the pickle, I know how it sounds from when I'm listening while tracking. But there is no way to let you hear that cause when I play it back I have this, sort of 'smacking' sound.. It's the sound that comes in after a few seconds. I only know it from low quality mp3's, they used to have the same. Some sort of digital distortion or clipping? But it's not constant either. It's the strangest thing, it's not there until after the drum has been recorded.. So, that points into the direction of your recording setup. Possible cause might be that there is a very short, high amplitude pulse at the beginning of your drum-hit, that causes the input amplifier to mess things up. I have looked at it with Audacity and there is a very sharp pulse at the start of (almost all) kicks. You could try to add a 10nF capacitor from pin 3 of the 4069 to ground, which add a 100Hz low pass 6dB filter, so together with R2 and C6 you have a 12 dB 100Hz low pass filter. Man! I cant believe I missed that Ha, thanks Grumble! I will get cracking then and ad that cap. Hmm.. that didn't do it. The kick does sound a lot nicer now But it's still there.. I made a new clip and looked in audacity and the beats that have it do look a bit mangled. You can hear it really clear on headphones. It comes in after a few beats. I went over the circuit today and drew out exactly what I've done. Just to be safe. So it is 2 voices, a kick and a woodblock, both on one 4069. There is a lot of bleed, every gate triggers the woodblock even if it's from the kick in, I don't really know why but I like the patterns I can get running it with the 4015. It gives the rhythm a bit of a push or swing. I went over the circuit today and drew out exactly what I've done. Okay .. so you did not ground the two unused inputs and you did not put a decoupling capacitor over the two supply pins? You should do that. Also .. do you use a battery supply maybe? In this case also add like 100 uF or so over the battery ... to be done near the IC. This should solve the strange phenomena ... and it may get rid of the starting glitch too .. so a recording might just work then. So 100k from unused inputs to ground, a 0.1uf decoupling cap for the chip and a 100uf capacitor for the circuit between + and ground. I'm powering things with 5v. 9v coming in trough a wall wart and then with a L7805 voltage regulator down to 5v. Alright! I have a clean signal Still a bit strange but good strange now. What Blue Hell said made me think, I actually had not recorded it straight into to computer. But into my 4 track (digital, but well over 10 years old) cause I have no decent interface (cause none of them work under Linux) except for a 30euro Behringer U-control. So I tried that just now et voila! Beautiful waves I think it has something to do with the sample rate. I guess you have a too long trigger pulse going from shift reg. Just try hook up a monostable with time constant about 5ms, positive near pulse. The size of the capacitor at the drum input is either small, you get one positive spike althought low energized and negative spike at end of pulse remains negligible. Or, the capacitor is big enough, the spike at the rising edge has enough energy,but the negative is audibly present and affects the sound.Similarly as yours samples, sounds the twinT circuit when it is directly connected to 4017. Better solution is to connect AND gate with one input clocked with short (5ms)sync pulses. Thanks IGR. I have to admit that some of the things you mention are a bit too complicated for me but I have had trouble with that 4015 of mine. It gives me a gate out and Ive been trying to turn those gates into trigger pulses mostly in an effort to get it to multi trigger (like 3 times in a row for example) without much luck so far. I didnt realize this could also be the cause of the twin-t's strange behavior. Last thing I tried was this little circuit which gives me a trigger pulse but still no multi trigger. I have no idea how many ms the triggers are though. Time constant of R2 * C1 is 87e3 * 27e-9 (when I read the values correctly from the schematic) .. or roughly 2.5 ms .. the trigger will be a tad longer than a time constant .. say .. maybe 3 to 5 ms -> repeated triggering should be possible at like 100 times / second or so -> something else is preventing it. That might help with triggering.